The Lord of the Rings is one of the most beloved franchises ever made. Everyone surely can remember their first time when they sat through the ridiculously long but amazing movies. They are as long as they are amazing and everyone has their favorite character from the very memorable cast, such as Frodo the hobbit or Aragorn the ranger heir to the throne. Let’s not forget everyone’s favorite wizard, Gandalf, who has graced us with immense joy through the performance of Sir Ian McKellen. Getting back to the subject at hand, many people feel like they need more Lord of the Rings in their lives despite receiving a second trilogy in The Hobbit. For those that are looking to dive deep into the universe of Tolkien once again, Middle-Earth: Shadow of Mordor is the perfect answer. This game takes players through the land of Mordor, a place Frodo tried so hard to reach in the movies. Before you get too excited, you must know that you’re not going to play as Frodo or anyone else from the movies for that matter. But don’t fret because the game’s protagonist is just as interesting. His name is Talion and he is a ranger just like Aragorn. Talion meets an early demise, to be precise right after the tutorial ends (umm, spoiler alert?) but continues to walk the earth with the help of his new friend. His spirit merges with that of an elf wraith and the two set on an epic adventure fueled by the need for revenge as well as self-discovery. The two need each other’s help to complete their goals. One wants to exact vengeance on those who have wronged him while the other one wants to find out more about who he is, as his memory has been lost. In the movies and books, there’s no question about it, orcs are your enemies and you need to kill them before they kill you, or if not run for your life. The game proposes something different. While they are still your main practice targets as you hack and slash through the half-witted creatures, using all your different skills and abilities you learned throughout the game, you can also enroll them in your army. 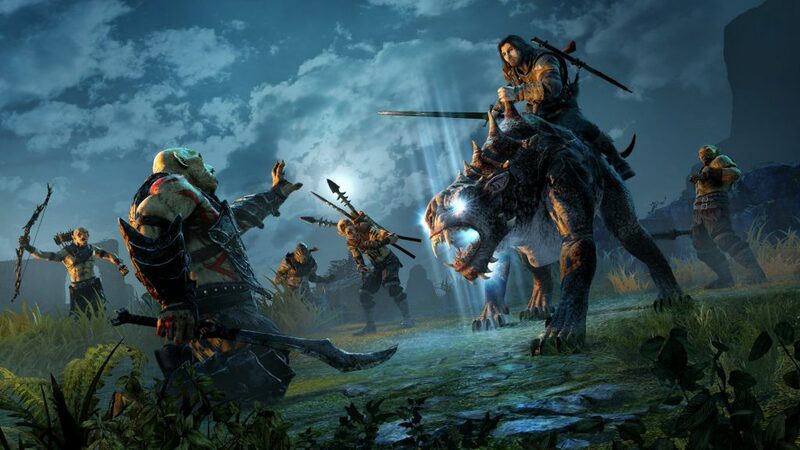 Yes, in Shadow of Mordor, Talion is building an army and he needs lieutenants and captains, as well as pawns. When you fight the orcs, you can either kill them or subdue them. The latter option makes them your mind-slaves that fight in your name across bigger, stronger foes. Middle-Earth: Shadow of Mordor does a wonderful job in capturing the atmosphere of a place like Mordor, staying authentic to Tolkien’s style of fantasy. Surrounded by enemies in a dark land, players must learn how to use their powers and to take advantage of strategy to beat their foes which are not nearly as smart but always more in numbers. The game has been out for some time and is available on sites like this one for a discounted price.